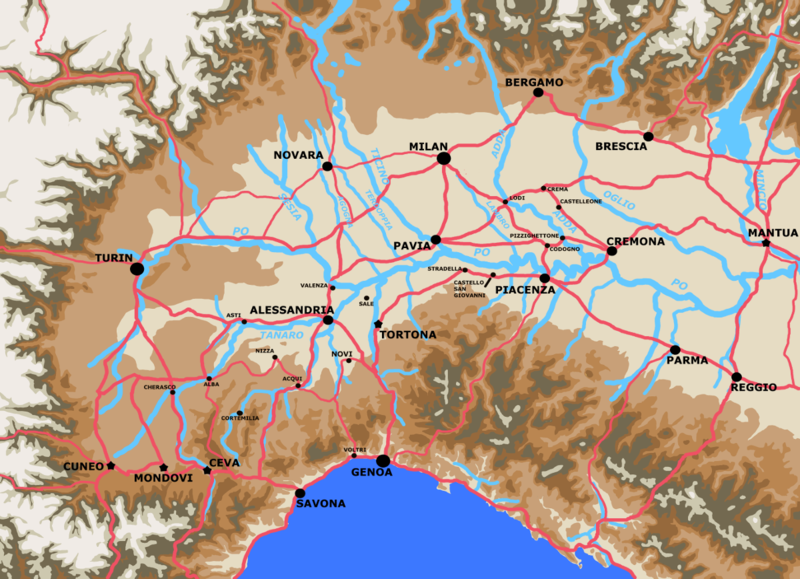 Napoleon Bonaparte's Army of Italy takes Lombardy. Map showing overall theatre of operations from late April to late May 1796. Maps showing the starting positions of the Armies. 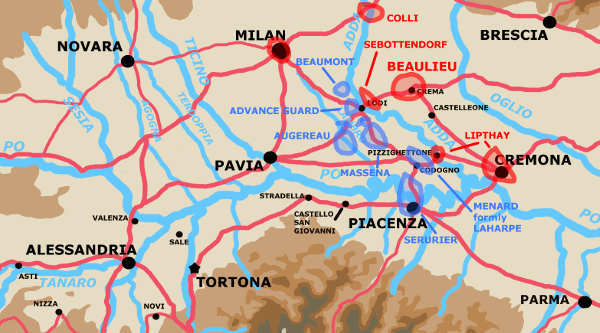 During the period of roughly a week between April 28th and May 5th Beaulieu's Austrians fell back from the area around Alessanderia via Valenza to a defensive position behind the Po. 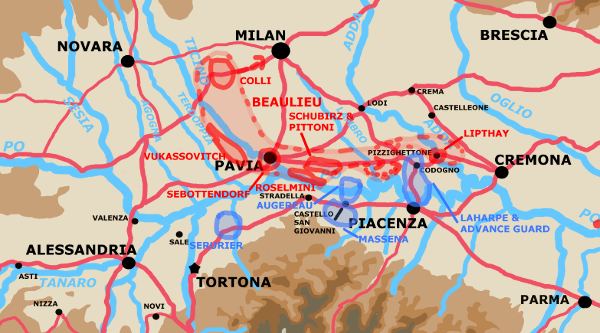 Bonaparte followed up via Alessandria and Tortona, his starting position as of the 5th basically had two divisions threatening the Austrians to their front around Valenza and his other two "active" divisions and advance guard further along the Po poised to begin his flanking movement. Situation roughly around 28th April. The first map is an approximation of the situation on the 28th of April. Note the map is in error in that Ceva did not actually surrender to the French until the 29th of April. The Alpine Brigades had orders to march on Cuneo (Coni) as of the 27th via scouts from Fiorella's brigade but their actual positions here are conjectural. French organization at the beginning of May 1796. Note that Laharpe's division having been left in poor hilly country to guard Bonaparte's flanks has not enjoyed the improved supply the other French divisions have in the plains of Piedmont. As result despite being key to Bonaparte's plans it is in poor shape and fragile, prone to mutiny or disperse to loot given any opportunity. A return for 29th April (Bouvier p.707) gives a total of 32,337 men for the four 'active' divisions. On the 29th of April Beaulieu's HQ was at Marengo later famous as the site of the battle in 1800. Beaulieu likely had somewhere between 16,000 and 24,000 effective troops. Returns of May 7th show 36 battalions and 44 squadrons, for 20,691 infantry, 5,441 cavalry, 53 guns, and 16 howitzers. Note that the forces any given Austrian sub-commander had under control varied frequently as they did not command forces with a fixed structure. Also exact numbers are rare and sometimes suspect when available. Generally force sizes tended to be given in battalions (infantry, abbv btl) and squadrons (cavalry, abbv sqn). Strengths varied but about 550 men for the average battalion and 150 troops for the average squadron will serve as a rough guide. Many detachments most notably to hold Po crossings. The Austrians finished their bridge at Valenza on April the 30th. That same day Beaulieu moved his HQ to Valenza and began withdrawing his troops. Most of them including the main force, Lipthay, Schubirz, and Vukassovitch fell back towards Valenza, but Roselmini's left wing fell back through Tortona with the aim of crossing further down the Po. Sebottendorf crossed the Po on the morning of the 2nd, and took up a position twelve miles north-east of Valenza behind a stream called the Erbognone, between Valeggio and Ottobiano, where the HQ was also established. Lipthay followed, and placed himself a few miles closer to Valenza, at Lomello, on the Agogna. Here he was joined by Schubirz. The last to cross at Valenza was Vukassovich, who had the bridge demolished, then formed a cordon along the river from a point opposite Valenza to the confluence of the Agogna. Roselmini, still on the other bank, continued his march and went via Casteggio, which is on the edge of the foothills opposite Pavia, to Casatisma, a couple of miles closer to the Po. The Armstice of Cherasco with Sardinia was signed on the 28th of April, formal peace was not arrived at until May 18th and Bonaparte did not hear of it until the 20th essentially well after the campaign against Lombardy was over. So not only was the Army of Italy out of place for an attack at the beginning of this period, but throughout it its communications were uncertain. Bonaparte was lacking a bridging train and his artillery train was limited and slow in keeping up with the rest of the army. Nevertheless of Bonaparte's four active divisions he was able to considerably improve the supplies to and equipment of Serurier's, Massena's and Augereau's divisions from the cities and magazines of Piedmont. LaHarpe's division the one in actual contact with the Austrians and the one best situated to lead an attack on them was less fortunate having been stationed in relatively poor hill country throughout the operations against the Piedmontese. It is notable that in the period between the 28th of April and the 4th of May that Bonaparte crossed the routes of LaHarpe's and Augereau's divisions, LaHarpe moving to a point south of Tortona and Augereau to one (Bosca) south of Alessandria. These divisions along with an advance guard formed on the 3rd of May were to lead the French flanking move on Piacenza. Rusca's brigade of Augereau's divison was ordered to scout along the south shore of the Po and gather all the boats it could find. The other brigades were given a limited time to rest. Massena's division moved up to the area of Sale, east of the confluence of the Tanaro with the Po, following the course of the Bormida and Tanaro to do so. Massena was ordered to gather boats from all these rivers and make obvious preparations for a crossing in this area. 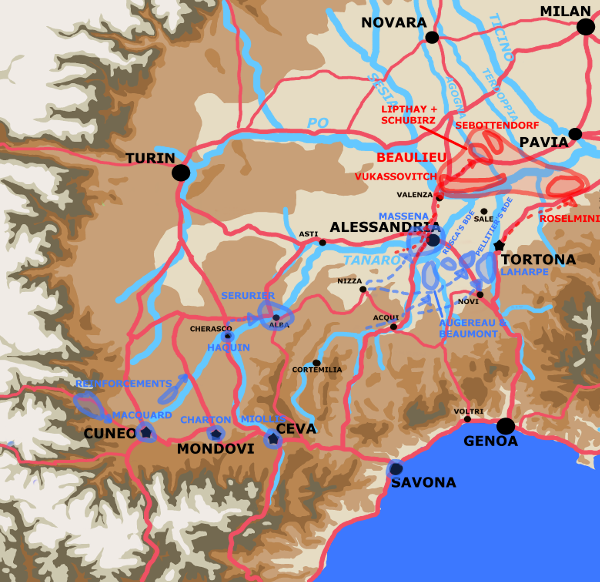 Massena's division, along with that of Seruriers which moved up from Fassano via Cherasco, Alba, and Asti north of the Tanaro to Alessandria, was intended to threaten a crossing of the Po at Valenza and hold Beaulieu's forces in place there. Covered by the Po Bonaparte moves to threaten the Austrian line of communications. Bonaparte ordered the reorganization of his Army including a special advance guard under Dallemagne on May 3rd and the operation began on May 5th. It was the start of a hard five days of marching and fighting. Lodi on May 10th marked the end of the most intense operations although it was another week before Milan formally surrendered. On the 5th of May LaHarpe moved from Tortona to Voghera along with the cavalry. Augereau's division moved on Laharpe's left. The Advance Guard made it to Casteggio in the foothills south of the Po and opposite Pavia. One brigade of Massena's division, Joubert's, moved to a point just west of Voghera. The rest of Massena's division continued to demonstrate around Sale. Serurier's division made it to Alessandria. By the evening of the 6th of May the Advance Guard under Dallemagne had reached Castel San Giovanni half way to Piacenza. LaHarpe's division and the cavalry made it to Stradella. 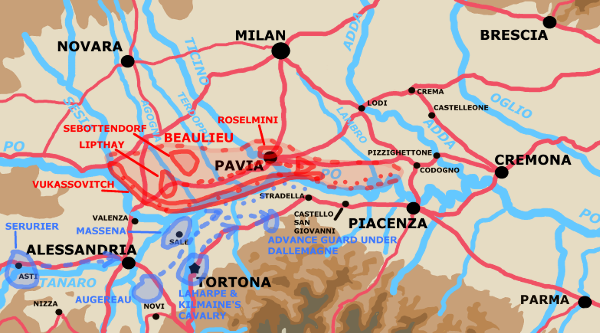 Augereau's division "was a little behind them"
On the 7th of May the advance guard and the cavalry crossed the Trebbia into the Duchy of Parma. The advance guard reached Piacenza at 0900 in the morning. LaHarpe's division followed moving on the Po at its confluence with the Trebbia. Bonaparte made the decision to cross the Po at Piacenza (actually just west of it between it and the confluence with the Trebbia) at midday. The first French troops under Lannes commanding one of the Advance Guards two infantry brigades crossed the Po at 1400 (2:00 pm) in the afternoon. The rest of the Advance Guard and LaHarpe's troops followed but with limited means the crossing was slow. LaHarpe's continued to cross the Po through out the night of the 7th and 8th. Augereau reached Castel San Giovanni at 1730 (5:30 pm) on May the 7th and began crossing the Po there using seized boats. The morning of the 8th of May saw the Advance Guard completely across the Po and LaHarpe's division mostly so. Augereau's division was still in the process of crossing. During the 8th Serurier reached Voghera and Massena Castel San Giovanni. 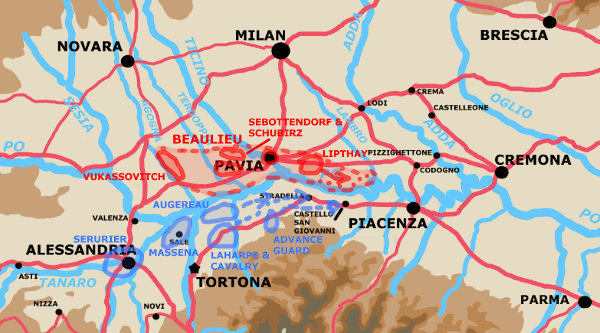 Around midday on the 8th of May the French Advance Guard and LaHarpe's division clashed with Lipthay's roughly 5,000 men who were holding the town of Fombio which lay between the French crossings and the town of Condogno on the road between Pavia and Pizzaghettone which formed the most direct route to Cremona and then Mantua. This was the battle of Fombio which although it was small scale was hard fought and of critical importance. Lipthay managed to repulse the initial French attack on Fombio at midday with heavy losses to both sides. However, outnumbered, out of contact with Beaulieu with no apparent support in prospect, and being flanked he decided to retreat on Pizzighettone a fortified crossing of the Adda during the afternoon. He had to fight his way back. He took further losses and some of his units had to retreat via Lodi rather than Pizzighettone as intended. See the battles page entry for Fombio for more details. Laharpe and the advance guard moved up, the advance guard screening Pizzighettone, and LaHarpe's troops occupying Codogno. Beaulieu who had made to just west of Fombio and Codogno during the day sent a column under Schubirz to recconnoiter Codogno during the night. Schubirz showing initiative decided on a surprise attack that resulted in confused and bitter fighting that lasted all night. During this fighting Laharpe was shot and killed. First Berthier and than Menard took charge but the loss contributed to the confusion that lead to a loss of French impetus on the 9th. Other contributors were doubtless fatigue from multiple forced marches, the intermixing of a variety of units, and the slow and awkward crossing of follow on troops. In any event the 9th May saw Beaulieu successfully order a retreat behind the Adda mostly via the crossing at Lodi. The process was sufficiently confusing even for those present at the time that I have not attempted to prepare a map for it. In any event most of the main body appears to have crossed at Lodi during the day of the 9th. Sebottendorf starting from Pavia marched all night but was still twelve and a half miles short of Lodi at 0900 (9:00am) on the morning of the 10th. Vukassovich's rear-guard and Roselmini's screening force appear to have been following behind him. Between about 0900 (9:00am) and 1130 (11:30am) French forces clashed with rear guard elements under Vukassovich and Roselmini on the route to Lodi. During the afternoon of the 10th the Austrians under Sebottendorf and the French under Bonaparte clashed in a minor but furious and famous battle as Sebbettondorf fought a rear-guard action at Lodi. The French with considerable forces coming up managed a tactical victory at Lodi, but the Austrians achieved their strategic objective of escaping more or less intact. Situation on evening May 8th. See the battles page entry for Lodi for more details. After Lodi Bonaparte moved to take Pizzighettone but thereafter called off his pursuit of the Austrians to re-organize his army. 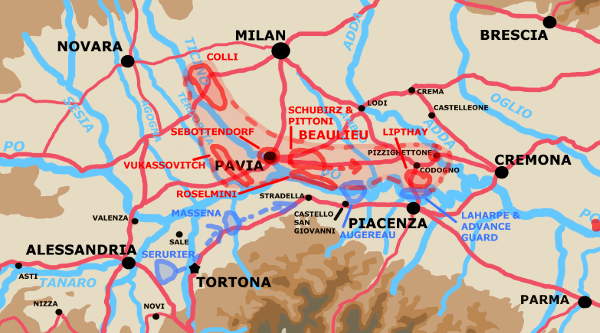 Beaulieu pulled back to Mantua and the line of Adige. 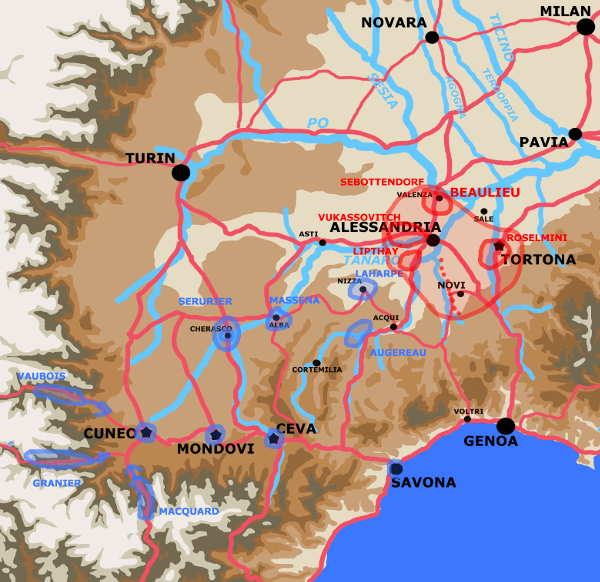 Massena reached Milan on the 14th of May. The French entered the city on the 15th. The castle with a garrison of roughtly 1,800 effectives and considerable military supplies including artillery continued to hold out. The French Army of Italy now received several days of rest, and on the 18th of May Bonaparte ordered it be paid for the first time in a very long while. On the 19th of May he ordered the pursuit of the Austrians to be resumed. Bonaparte's taking of Lombardy despite having just finished a punishing campaign against Piedmont and his lack of a bridging train to deal with the swollen Po river was a significant achievement. It was likely less of an achievment than he would have liked. He probably had hoped to cut the Austrian army off from its supply lines back through Mantua and the Adige. Ideally he would like to have destroyed it, but failing that forcing it back towards the Alps and keeping it from from reinforcing the fortress at Mantua was extremely desirable. His army did not have either a proper seige train or the proper logistics to sustain static warfare. More ever he was fully aware of how unhealthy the area of Mantua was in the summer. For those of you who understand some French (something this author is very poor at) the following sources referred to in Boycott-Brown will be of interest.